Top Tips On How To Create A Beautiful Life! Creating a beautiful life for ourselves is possible. And in order to do that we have to strive for balance and that means addressing all areas of life. I observed that last year I was very much only focused mostly on one area of my life and that was my businesses. I thought that I would use this blog to show you what I have been up to and also how I have got the balance back in my life. Having just become a representative of Miessence selling certified organic personal care and house hold products meant I needed to pay careful attention to keeping my life balanced. I have two other small businesses to contend with meant other parts of my life had become unbalanced so this year was about adopting a holistic approach to get that balance back. I thought that I would write this blog for people who tend to focus only on one part of their life. I thought I would use use my own experience and show you how I have been getting the balance back in my own life to help you do the same. Plus I thought that it would give you an opportunity to see what The Earth Faeries have been up too. Firstly I looked at my creative area. I realized that while I was making accessories for my customers I rarely had time to make anything else for myself or my loved ones. When mum expressed interest in what I was making I always said I would make her something but never got around to it. Time was always a factor so I read an article about creating more time and doing things that are important to us. I devised an affirmation that has worked wonders in my life and has done just that. As they say we are living in a quantum field and thoughts become things. And so do the affirmations that we recite every day. The affirmation that I use is: I always have time for the activities, people and experiences that are important to me. And sure enough time has been created and I suddenly have more free time. And so I got to work on my mums ornament that I have made her. I made it in her favorite colour which is buttermilk yellow. You can find my full range here. It comes with a little hand made scroll too with a personalized poem in it so I am just working on that at the moment. I just hope she likes it. 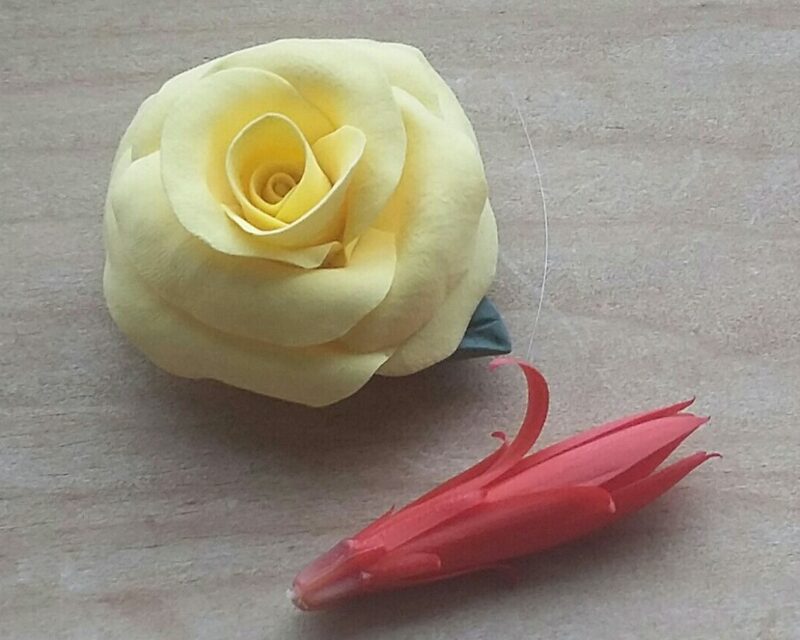 Here is a sneaky preview of the rose I have made for my mum. Each rose is named after its owner and I called this one Barbara Frances after her. Secondly I decided to start focusing on doing more self development work on myself. I am a qualified and practicing life coach – specializing in spiritual coaching and well being coaching. I knew working on myself would creating more energy and momentum in my life to facilitate change. As part of my self development I do earthing while practicing mindfulness in my big garden, forests, and woodlands. I practice earthing otherwise known as grounding about once a month but now have started to do it every day and am observing a massive difference in my energy levels. So how does it work? The free electrons in the earth move through our feet and into our body and create well being in our mind body and soul. My word this year has been contribution. Giving back! Giving feels so good so I thought I would like to do more of it. I am all for looking after our planet so I decided to volunteer at Garth organic fruit and vegetable garden in Wales. It was the most enjoyable day that I have had in ages and it was lovely to do something different and to help others out too. It is surprising what opportunities you get given when you get out of your comfort zone because I got asked to run a mindfulness work shop there so am making time now to devise my lesson plans and I am due to run them this August! The earth Faeries love getting inspired in nature so I started some voluntary work in an organic gardens! It was an eventful day. I learned how to grow baby onions. Although I have grown potatoes carrots and lettuces in my own garden I have never grown onions. A lesson learned from there was not to plant them upside down and I suppose metaphorically speaking the same applies to us – so always reach for the light to get you to the places you want to go. I also learned how to grow the food in rows and to measure the depth I was planting them in as well as how to space them correctly so they had room to grow. I did this by using rope tied around pieces of wood and put in the ground. The rope once stretched out helps you to plant the crops in a straight line. I also got to see some slow worms too which resemble beautiful snakes – as Jude the owner of the organic gardens prized back the soggy straw they sliver deeper down into the earthy layers. They slithered away before I could get my camera out. I got to meet some other lovely volunteers too and it was nice to share a common goal with them which was looking after the planet that I love so much. Plus I got an abundance of organic vegetable and salad in return for helping out. There is something lovely about eating fresh salad and sprouting broccoli from a garden that you have picked yourself. It tastes so much nicer! I have just been asked to come canoeing in Llangollen canal with my daughter and while my mind says I have this to do and that to do I stopped, and said to myself I always have time for things, people and events that important to me so I said yes. My other friend has just invited me to London for the vegan and vegetarian food festival and I said yes! So one of the secrets to having a beautiful life I have learned is to say yes to more opportunities. Getting balance in your life so you can have a beautiful life is not a destination. It is a journey. We are always striving for it as circumstances and goals change so we have to continuously address the balance. And what I have discovered is that with those changes we have to pause, reevaluate what is serving us and what is not so we can modify our goals and then get back in flow. For me having a beautiful life is about keeping the balance in my own life on a consistent basis. For me keeping that balance means coming up to smell the roses regularly and not being hard on myself when I go off track slightly. It is also about being mindful too – living in the moment, being non judgemental if my mind strays elsewhere and jumping straight back on again. What other techniques or practices are you using to keep your own life well balanced? 2 top tips for achieving your goals in 2018! Happy holidays everyone. I hope that you have all had a lovely seasonal time. In this blog I am going to tell you what I have been up to over the festive season and have a look at some of the high lights over the year. Plus I thought I’d tell you some of my new plans for next year as well as give you some tips on how to build up momentum and confidence to go forward with your goals. The snow had come and gone by Christmas. If you have been following my blogs you will have known that I have been building snowmen, sledging in the garden and country lanes. This was taken before Christmas. I was hoping that it would grace us with its presence for Christmas but it didn’t. However it has started to snow again today so am wondering whether I will have a thick blanket of snow on the ground when I get up. I had my mum, daughter and her partner here for Christmas who made it really special for me. My daughters’ partner dressed the table and the Christmas tree. On Christmas day we sat around the tree and opened our beautiful gifts. Watching faces smile in delight at the gifts they had received brought a smile to my own face. Christmas isn’t just for children. It is there to keep the inner child alive in all of us. That’s one of our dogs presents in the green stocking! I think it’s not about the material things, although they were beautiful presents, but it was about the sharing of good times and the memories we all created together. Plus it is all the little things that everyone did like bringing the logs in and lighting a lovely fire that made it all warm and cosy. Plus dressing the table so it looked warm and welcoming for everyone. My daughter and her partner spent hours in the kitchen preparing and cooking a gorgeous feast for us all. And I had fun photographing it all. However this was the only picture that turned out! My daughter and her partner preparing food for us all. Our cupboards were full to the brim with food but I don’t think we ate in excess however it was nice to have such a wonderful choice of food in. We always have an abundance of food to eat but I am not used to opening my cupboards and having the food fall out. My mum bought us a gorgeous home made yule log that was suitable for vegans. The lovely lady who made it even delivered it right to our door with a smile. Can you imagine when I opened the big box to discover this beauty. And yes it tasted as divine as it looked. There is something wonderful about buying hand made produce. I think it tastes so much better because you can feel the love and time that has gone into such craft man-ship. Like the Japanese I am very much a believer in the energy/essence of a person that goes into our cooking or the products that we buy. This is why the Japanese say it is so important to have good thoughts and be happy when we are creating things. It is something that I adhere too when I cook and when I craft too. After sharing lots of good times with my loved ones I spent boxing day on my own. I wanted to do some photography and it is a solitary hobby after-all. And as one person pointed out to me, you are never alone when you have the universe with you. I am a true believer that the universe not only lives inside of us all but also in the landscapes, in the elements, the animals, the trees, vegetation and in all that lives on this planet so I happen to agree with that person. So whilst the rest of them went to another family members house for lunch on boxing day I headed out with my camera (part of a 7 day black and white challenge I am on). As I sat in the forests, splashed through the streams and finally came to stand on the moors I felt more closely connected to nature and the universe than ever before. I was grateful for it all for keeping me company. As I surveyed the landscape before me I was in awe. There were thousands of hectares of heather all over the moorlands and dramatic hills that my lens just about captured. The blue sky had wisps of clouds and their was the odd bird that swooped down before taking flight again. Rock pools were all frozen and there was a light scattering of snow here and there that looked like icing sugar. One can never feel lonely in such an environment of such beauty where the universe is present in all of it. And as I listened all I could hear was the sound of silence. And I thought to myself that really is the key to feeling connected to oneself and all that there is. For it is in those moments that we have our biggest insights and our higher selves can get through! Hundreds or acres of heather stretched before me. All I could hear was the sound of silence. Sheer bliss. And then on my way back I sat in my favorite forest eating my pack lunch. Watching the light in the sky begin to change I realized that it was time to head back home. I never look at my watch when I am out but have learned how to tell the time from the position of the sun and also from the light. I was back before dark, reminiscing about my adventures and already planning more of them. Today I decided to write my blog about my experiences but also to look at some of the high lights of 2017 and my new intentions for 2018. Here they are. I think it’s so important to review the progress we have made. It really does give you momentum and the confidence to go forward in 2018. I had two super earth faeries characters designed and made for me by a wonderful artist. These are now featured in my Earth Faeries stories on my website if you’d like to follow their adventures. I re-branded and made my products all suitable for vegans as I became one myself this year. I sourced out new suppliers who stock materials that our suitable for vegans. They took quite a while to find but I got there in the end. I stopped making jewellery and decided to create hair accessories instead as I found that is where my passion lies. It is okay to modify your goals as long as you can explain to yourself why. I learned a new jewellery making skill (wire work) and started making a new product line. I started practicing gi gong again. It is Movement meditation that has really helped me connect and keep my inner balance. It so easy to work yourself in the ground if one doesn’t maintain the balance of work and play. I opened two new online shops and a face book business page. I got lots more new wonderful followers on my groups and made some lovely friends on there too. I got lots of glowing reviews from satisfied customers and repeat orders. It is nice to know that people are liking what I am making and makes it all so worth while. I attended two craft stalls. One of them was in a fabulous location outside of a castle. And I even had my dream come true which was to go canoeing around the moat. You can imagine my delight when I was about to set up my stall and I discovered that one of the attractions was canoeing. With over an hour and half before the customers were due into the grounds I knew I had time to go canooing for the very first time. My friend who also had a stall came with me (she had no choice as I literally grabbed her hand and pulled her in the direction of them. We had much fun once we managed to get out of the reeds. I did some traveling to Lincolnshire with a good friend and attended a wonderful weekend at a laughter festival. I even got to play drums in the woods, have an Akashic record reading done for me and participated in heaps of other fun activities there too. It snowed right before Christmas and I had another dream come true. I went sledging in my garden. You could hear my screams of joy from many fields down. I received £3,800 which enabled me to shop to my hearts delight, go for weekend away and invest some of it back into my business. I got a camera given to me that I haven’t used yet as have to send off for a new lead. This will help me improve the quality of my product pictures and also help me with my new hobby which is photographing the landscapes and wild life. I devoured many books on photography to improve my photography skills and realized I now have a passion for it. So I am out most days photographing the vast terrain in this stunning place I live in. I never stop being grateful for where I live. I was nominated by a friend to do a black and white photography challenge for 7 days. And I have been out hiking in the Lovely Welsh countryside taking them and enjoying the sound of silence in the wilderness. I waited about 15 minutes for this photograph. Finally he turned his head and I was able to photograph this handsome fellow. I discovered a great photographer who was recommended to me. I am sending my products too him in 2018 to have them all professionally photographed. I had my new product range measured for me so I now know the exact sizes of the boxes I require. Many a night I sat there wondering what colour boxes would fit in with my theme. I had a good response from my FB group who gave me lots of ideas. I am thinking white! They are a very helpful bunch. I made two new friends and got to go walking with them and I also got to spend a lovely weekend away with a very close friend. And in 2018 I have lots more plans for the Earth Faeries and my own personal goals. Here are some of them. I am getting my third earth faerie character drawn up for me. I have some new craft stalls already planned. A holiday with a friend to Norway. We have decided to go Kayaking in the Norwegian fjords and do some wild camping. Yes I will be sure to post the pictures! Booking another laughter festival but this time it is being held closer to home in Wales. Learn another new jewellery making skill. Have more micro and micro adventures where I live. Advance my photography skills of landscapes so I can share them with you on my pages and blogs. Go out for more hikes and do some wild camping. Treat myself to a spa experience, indulge all my senses and go kayaking in the nearby lake. Buy a new bicycle and start cycling again. Explore other beautiful rural parts in UK. Share more good times having adventures with my friends. I find writing this has given me more direction too and it really makes me realize just how far I have actually come. I thought I’d share it with you to help you too. So before 2018 comes be sure to get your pen and note pad out, jot your progress down no matter how small or big and any new goals for 2018. It really will help you to go forward with a smile, optimism and create the right kind of internal environment to support you with all your en-devours. And most of all give yourself a big pat on the back on how much you have achieved! You as much as anyone deserve your own love! Wishing you all a fabulous new year all year round! How to over come the winter blues! In this blog I am going to show you how I have got over those winter blues so we end the year on a high note. I’d like to show you some of the fun things that I have been up too that has replaced those blues with eternal sunshine. There is something about this time of year that brings back memories of snuggling in front of a log fire and having snowball fun with my friends as well as with my daughter. However with everyone grown up now the fun has never ended and I am still doing the same. You can imagine my delight when I drew back the curtains several days ago to discover a thick blanket of snow had descended on the Welsh countryside. Of course it has brought draw backs as we haven’t been able to get out in the car and have been official snowed in. But one has to make the best of the situation so I have been sledging, taking pictures of the products I have made, photographing this beautiful wonderland and of course helping to build a snow man. December is not complete without a snow man. He did have a nose and arms but unfortunately our dog a 2 year old Labrador decided to eat them . The lighting has been fantastic to do some photography shots of my rose ornaments. You can see my full range here on my online shop. I am thinking about investing in a photography box but until then I grasp every opportunity when the lighting is right. After several attempts I took this picture in my garden and then ran in to warm my fingers on our log fire. Yep, that is how cold it is here. The Earth Faeries have had fun making this and photographing it in our garden in the snow! I took this picture in my garden. The roads have been very slippery up here in the Wales but that didn’t stop me from going for lovely walks along the country lanes. I normally go in the fields but with about 3 foot of snow now it is virtually impossible to walk in it. It stays extra light here up in the hills in Wales so I have been going for a walk in the midnight hour and with my torch light on my head. However with the thick snow clouds it has been more darker than normal. Normally I can look up at the sky and see all of the constellations and almost touch them. I spotted the sauce pan the other night. But since the snow fall there has been dark skies most nights so there has been no visibility. All of my senses kick in on my late night walks. Its is so amazing to hear the hoot of the owls, feel the soft snow flakes caressing the skin and the rustle in the bushes as some form of wild life dwells there. And then I stopped and listened and the sound was like music to my ears. It was the sound of silence! Snow is very metaphorical to me. It always signifies a clean slate and a new beginnings. A transition into an even better future. It has been beautiful watching the seasons change and although I do love the summer I think this time of year is one of my favorites. Snuggled up in front of the fire with a hot drink, a magazine or even with my goal work book is an enjoyable experience. It is a time of year to reflect and note the progress we have made, no matter how small or big it has been. It helps me build confidence and momentum to go forward in 2018. Occasionally I will glance out of my living room window to admire our handy work (the snow man). And this brings my attention back to the beauty of the now! As now is all we have. It’s a reminder to tell myself the past is over, the future is for my making and the now is all that matters. It is how I am feeling and what I am thinking now is paving the way for my future. One of my lovely gardens where I went sledging on with my family. And finally after 5 days of snow fall golden sun light has crept from beneath the clouds and the snow is finally melting. I can see huge droplets falling from my roof and the trees. I ventured out in the garden today to check the birds had enough food. I would have loved to have got some pictures as there was a huge robin red breast munching on the food. However the snow is all crunchy and alerted him to my presence and he took flight. It is always a good idea at this time of year to check the birds and wild life have food. Thankfully I checked as the birds had devoured the bird seed my daughter had put out for them so I’m off to the kitchen now to fill it up. Three tips to beat them winter blues and put the inner sunshine back in. So if you feel like hibernating at this time of year and feeling on the blue side then go out in nature. She will heighten all of your senses and make you feel alive! Being out doors is a huge mood changer. Take up photography. You don’t have to be great photographer to do it and if if you want to develop those skills there are plenty of free resources on the internet so you can learn. The most important thing is you are having fun. Not only are you capturing the moment in time but your also creating great memories and adventures on the way. Count blessings. Just think that you are in your lovely warm house and others may not be so fortunate. Look after the wild life, whether that is hedge hogs or birds etc, it is making a difference and give you a warm glow knowing that you are helping others. I hope you are all having a lovely run up to Christmas and enjoying the snow if you have it where you are. Keep warm and I will write soon. In this blog I am going to show you what the Earth Faeries have been up to. I am also going to introduce you to the lovely wonderland of where I live & run my home based business in the Wales UK. Waking up to a blanket of snow filled me with delight. I have such beautiful views from my windows of dramatic hills, land and woods. It is something that I never stop counting my blessings for. I am used to the lush greenery of the landscape so to be greeted with the snow was a pleasant surprise. I have only lived here for nearly 2 years and the snow has been quite shallow compared to previous years. However this year is the deepest I have seen it. It is a foot in most places and about 3 foot in others. I was awoken yesterday by my daughters excited voice as she bounded into my bedroom to tell me to look out of the window. Of course I shared her enthusiasm when my eyes rested on the generous helping of the snow that covered the landscape. It was a quick scramble for my hiking clothes and straight out of the door to play. I live in the hills so it’s not easy to get out in the car. And with the supplies running low and food unable to be delivered because of weather conditions there was no other option but to walk to the nearest village shop about 2 and half miles away. However all though it was a great work out for the muscles as I trudged through the snow (the gritters hadn’t been by then) it was a pleasant walk as I admired the hills that looked as if covered in icing sugar. We slid past forests, practicing our skiing skills. And then once we reached the village I took the favorite family photograph. It has become a tradition to take pictures of our feet. The descent was some what easier than the ascent. We live high up the hills and although I am used to walking down it and back up most days it was quite a challenge getting back up as a blizzard had come upon us and the icy cold winds stung my face. The clap of thunder like a lion roaring startled us all. I have never heard thunder coupled with snow. However on the positive side it all added to the micro adventure. When we got back the fun didn’t stop there as my daughters’ partner had bought a sledge. We ventured down to our garden which is on a slight hill so we got lots of momentum and sped down the hill. Each time going a little further and I was convinced I was going to end up curled around one of our trees at one point. However reluctantly I managed to navigate myself around it. My screams of delight are still ringing around the garden. By the time we had finished the darkness had crept in and the cold; I could no longer feel my fingers so we headed to an open fire in our house and a hot drink. There’s something lovely and Christmassy about being in front of a log fire. The following day the same thing happened my daughter told me to look out of the window. My mouth fell open as the snow which had been about only 3 inches yesterday was now over a foot in most places and in others much deeper. My cat ventured out but the snow was bigger than him so he came right back in. Out came the sledge and we trekked up the country lane that was situated next to our property. The snow was soft and thick and it was still snowing as we made a track down the lane. No cars could come down as the snow was too thick and the gritters hadn’t been out so we could relax as we created a track down the middle of the lane. Who says adults can’t have fun as we sure did. I couldn’t get any pictures as my phone had discharged. Have you ever noticed that children always find it easy to manifest. This is because they have great imaginations and know how to have fun. It is some thing that I feel that is important not only to manifest our desires but also to having an enjoyable well balanced life too. Having fun makes me feel more creative and productive too. I am more relaxed so ideas come to me so much more easily. I find I am in flow. And now I am back in my house, snuggled up in front of the log fire again, hot drink in one hand as I type my blog. Who else has had snow and been playing in it?